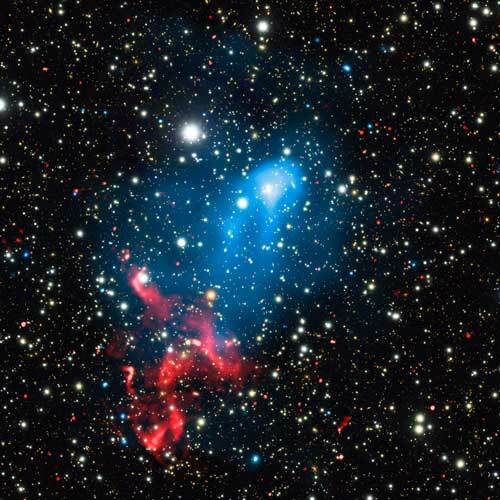 (Nanowerk News) Two of the most powerful phenomena in the Universe - a supermassive black hole and the collision of giant galaxy clusters - have combined to create a stupendous cosmic particle accelerator. By combining data from some of the best X-ray, optical and radio telescopes in the world, researchers have found out what happens when matter ejected by a giant black hole is swept up in the merger of two enormous galaxy clusters (Nature Astronomy, "The case for electron re-acceleration at galaxy cluster shocks"). Subaru gri colour image of the merging cluster Abell 3411–3412. The two clusters are both very massive, each weighing about a quadrillion – or a million billion – times the mass of the Sun. Optical data from the Isaac Newton Telescope, in La Palma and Keck Observatory and Japan’s Subaru telescope, also on Mauna Kea, Hawaii detected the galaxies in each cluster. The comet-shaped appearance is produced by hot gas from one cluster ploughing through the hot gas of the other cluster. First, at least one spinning, supermassive black hole in one of the galaxy clusters produced a rotating magnetic funnel. The powerful electromagnetic fields associated with this structure have accelerated some of the inflowing gas away from the vicinity of the black hole in the form of an energetic, high-speed jet. Then, these accelerated particles in the jet were accelerated to even higher energies when they encountered colossal shock waves – cosmic versions of sonic booms generated by supersonic aircraft – produced by the collision of the massive gas clouds associated with the galaxy clusters. These results were presented at the 229th meeting of the American Astronomical Society.